You are so right. It IS the gentle voice we need to be listening to and so often that is exactly the voice we can’t hear because of all the distractions. Beautiful piece. I think that’s excellent advice. You’re so right about everything coming at us with lightening speed. Hello, I appreciate your post. I agree, listening is the key to good communication with others and our self. I’ve always been better at listening to others than to myself. 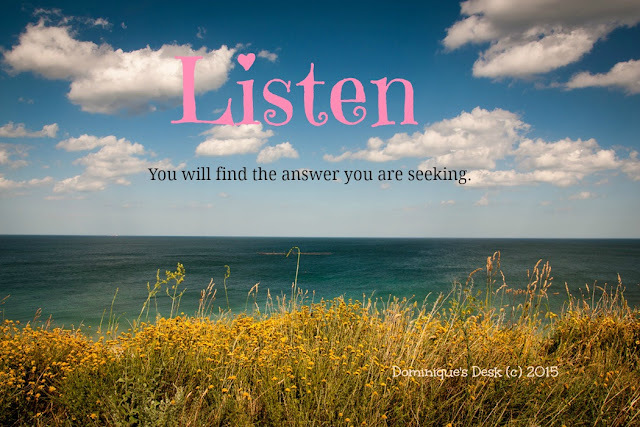 Recently I’ve been taking steps to listen to me. Listening is very important and I make sure I practice that everyday because it also shows that you care and you are interested to know about their life. Listening is the best way and only way indeed. This is why people who do meditations focus their sense thru listening only. I love how you expressed this and it’s excellent advice that I need to incorporate into my life. What an excellent link to the letter E.
We can learn so much when we are silent. This was a wonderful, thoughtful post.